A tire found to be inflated less than 80% of the fleet’s target pressure should be considered flat. Proper tire inflation pressure is critical to the optimal operation of a commercial vehicle. Underinflated tires result in decreased fuel efficiency and reduced tire wear. A 0.5-1.0% increase in fuel consumption is seen in vehicles running with tires underinflated by 10 psi. Having appropriate pressure reduces tire wear, increases fuel efficiency, and leads to fewer roadside breakdowns due to tire failures. Automatic tire inflation systems (ATIS) work to overcome one or more of the causes of tire underinflation by monitoring tire inflation pressure relative to a pre-set target and re-inflating tires whenever the detected pressure is below the target level. The system alerts the driver that the tires are being re-inflated but does not report on the actual tire pressure. The system relies on the vehicle’s compressed-air tanks or draws air directly from the surrounding environment using a self-contained pump. 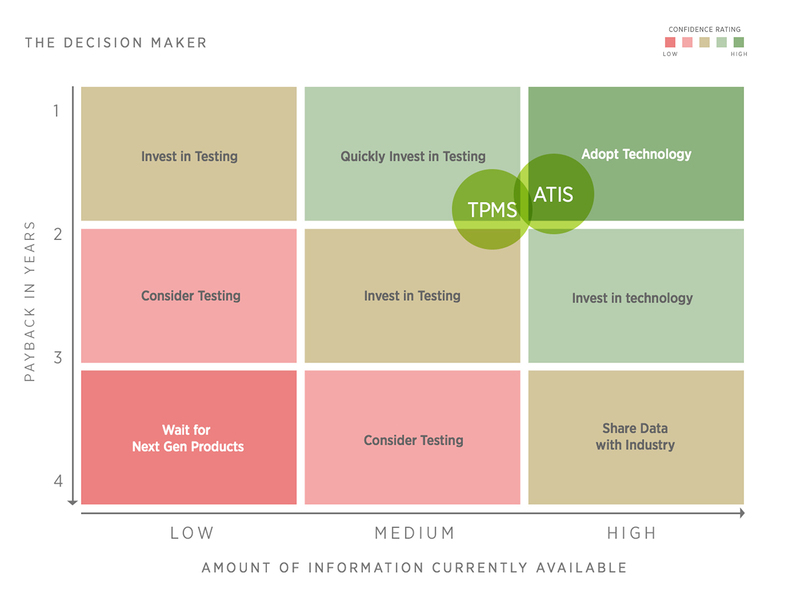 Of the available tire pressure systems, ATIS has seen the widest adoption rate. Executive Summary: More Regional Haul - An Opportunity for Trucking? The system keeps tires properly inflated, which reduces rolling resistance and improves fuel economy. Very low tire pressure can cause a tire to rupture causing a roadside breakdown. These systems keep tires inflated to their proper pressure level, and reduce roadside breakdowns. The system eliminates the need for manual intervention in the event of low tire pressure. The system maintains the tire pressure difference between the two tires in a dual assembly to 5 psi or less. Since the system alerts the driver when pressure is below pre-set parameters, drivers may ignore it when there is a serious low-pressure issue that the system cannot overcome. These systems require scheduled preventive maintenance at least every three months. 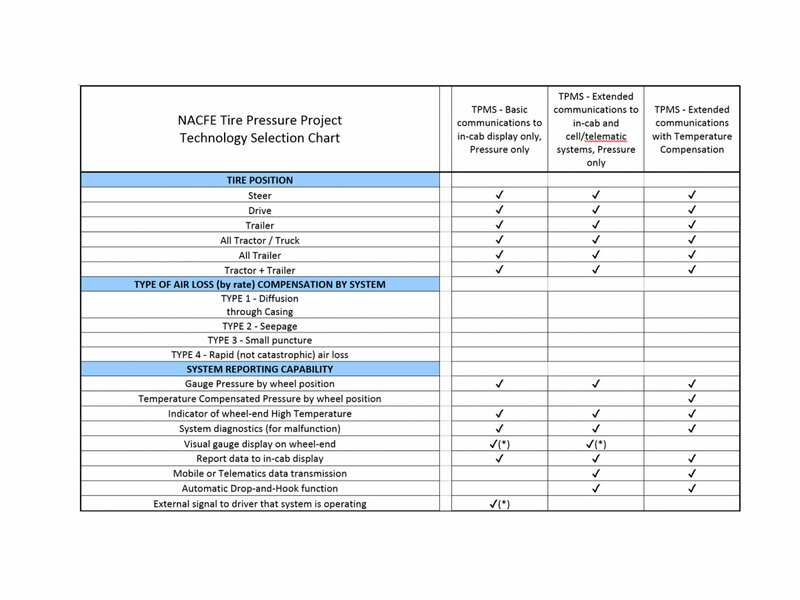 A technology selection chart was developed that identified the major characteristics of the various tire pressure monitoring systems. The tool condenses an immense amount of information into a single matrix that can assist in the selection of the correct technology for the fleet. 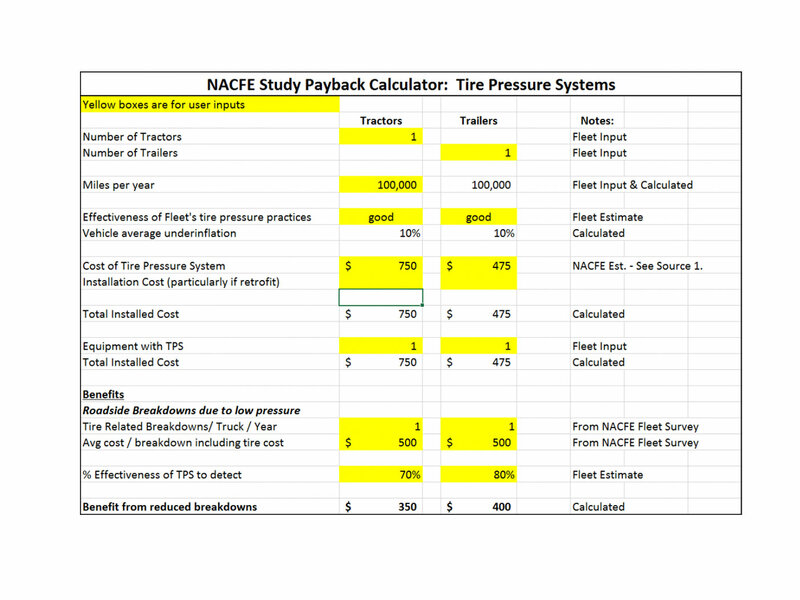 The payback calculator allows fleets to input data and estimate the payback of various technologies based on their benefits. It calculates the benefits based on savings from reduced roadside breakdowns, extended tire wear, and improved fuel economy. 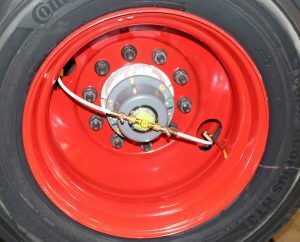 Trailer manufacturers indicated that about 40% of new trailers built have tire pressure systems and of the trailers equipped with tire pressure monitoring devices, 10% to 40% of those have automatic tire inflation systems on them. More customers are asking trailer manufacturers about ATIS and some trailer manufacturers are helping fleets with retrofitting existing trailers with ATIS. Axles are being supplied to the trailer assembly plant pre-drilled and tapped to better accommodate integration of the tire pressure systems on production lines. Fleets are recognizing the value of properly-inflated tires and have seen that the practice of having drivers manually check tire pressure is not sufficient. They are turning to automatic tire inflation systems on their trailers to solve the problems created by underinflated tires. For-hire fleets are more likely to adopt ATIS because of the high rate of driver turnover and the fact that trailers are dropped at sites away from the fleet’s own terminal.